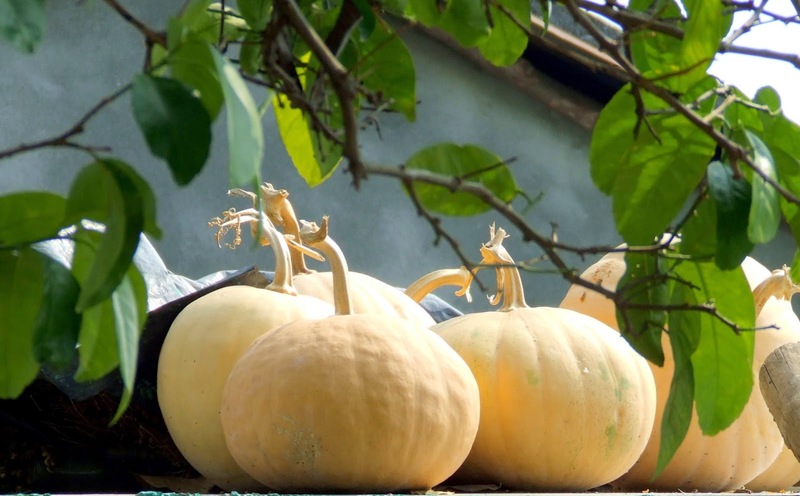 During our last trip to a nearby farm for buying vegetables, our eyes fell on a glistening rotund green pumpkin peeping out of the thick foliage on the thatched roof of our farmer. Having confirmed that it was a green pumpkin (because it is unusual to find one at this time of the year as the pumpkins are red and ripening on the roof for winters), we requested him to give us and he agreed. Thanking him for his generosity and feeling lucky, we decided to make pumpkin soup. According to Ayurveda, fresh vegetables have maximum prana (life force) and hence veggies should be consumed as soon as they are separated from the plant. With few carrots and an onion, we made Pumpkin Carrot Soup. Simple, nourishing and wholesome! Wash and cut pumpkin into half. Scoop out the seeds. Chop into small pieces. Peel and wash carrots. Chop into small pieces. Slice onions and mince garlic. Heat oil in the pan. Add onion and fry till translucent. Add garlic. Add turmeric. 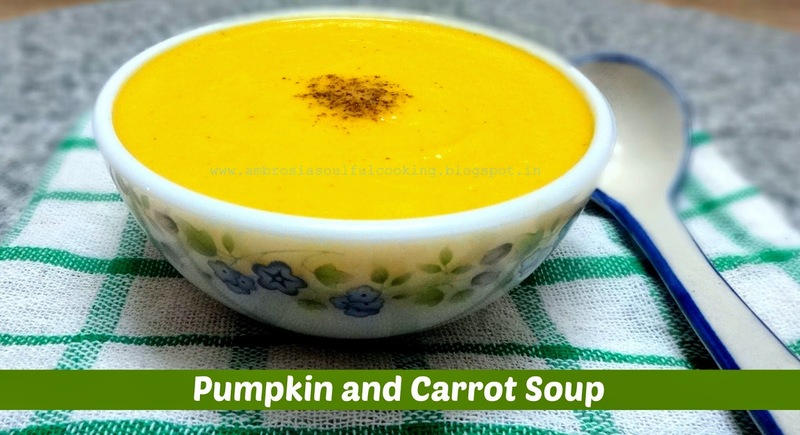 Add chopped pumpkin and carrots. Add salt. Cook for 5 minutes. Add water and sugar cook till pumpkin and carrots become tender. 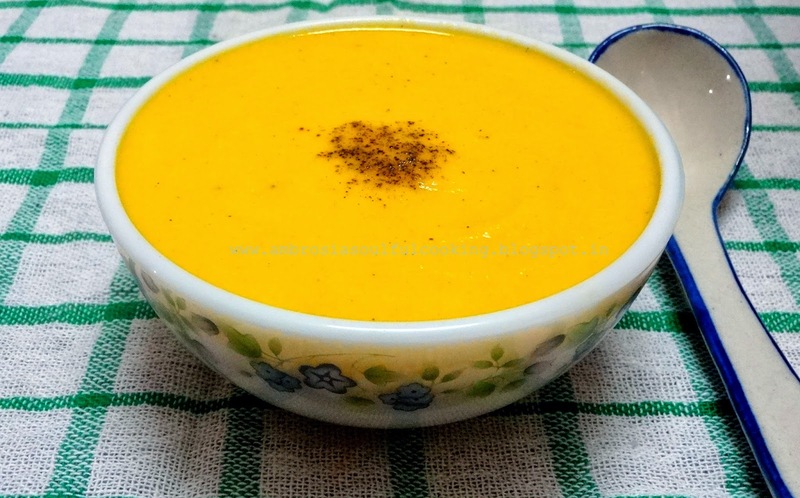 Blend the cooked vegetables with warm milk. Sprinkle pepper before serving. Serve hot with bread or enjoy plain. My notes: Adjust water according to your liking for thick or not so thick soup. Above recipe gives a thick soup. Adjust salt and sugar according to taste. Add more garlic if you love a garlicky soup. This recipe can be veganised easily. Add coconut milk in place of milk.